As a developer, a large amount of my time is spent reading documentation. An even larger amount of time is spent finding said documentation. Or it was, until Dash entered my life. Dash is an application that manages self-contained documentation packages, called docsets. You’ll find docsets for almost every language, library, framework, and content management system, and you can even import others to expand its library. By enabling and disabling docsets, you can tailor Dash precisely to your needs. Better yet, it stores all of this locally so you always have access—perfect when working on planes, or when on a slow or flaky internet connection. Its powerful search engine allows you to find exactly what you’re looking for within seconds—start typing and you’ll see results from all enabled docsets. You can even constrain searches to a specific area of interest by prefixing your query with things such as html:, css:, or sass:. At the bottom of the sidebar listing, there are helpful links to Google and Stack Overflow results for your query—helpful for those rare times when your search returns nothing in the documentation. Dash on its own has proven to be an extremely helpful addition to my workflow, but when integrated with Alfred, the speed is unbelievable. Alfred is a productivity app that speeds up tasks such as launching applications, finding files, and running scripts. Dash comes bundled with an Alfred integration that will hopefully blow your mind like it did mine. Rather than launching Dash, clicking into the search bar and typing your query, simply pop open Alfred (with your preferred key command—I use Option + Space), then begin typing your search, prefixed with dash. You’ll see a list of results right in Alfred; select one and you’ll be placed right at that point in the documentation inside Dash. 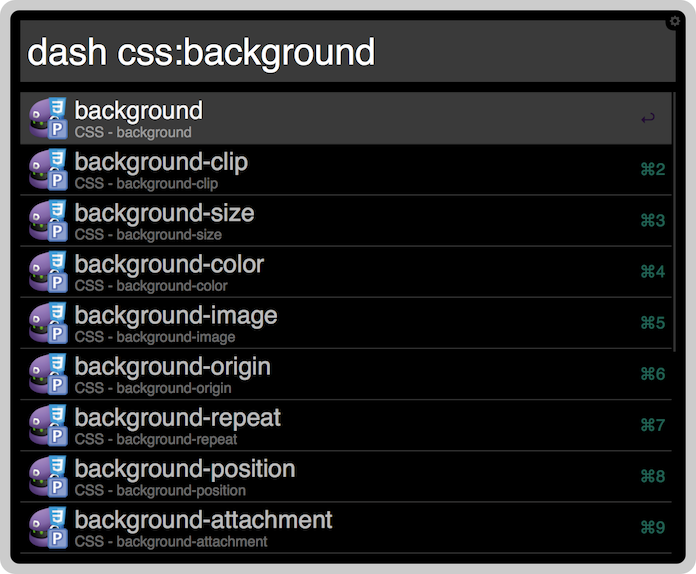 You can constrain your query in just the same way as above—for instance dash css:background. Unfortunately, Dash and Alfred are only available on Mac OS X. If you’re on Windows or Linux, it looks like Zeal is your choice. I haven’t tried it myself, but it was inspired by Dash, so it’s true to the spirit of speed and offline access. It may sound silly and lazy, but the integration of Dash and Alfred saves me tons of time every day. Being able to jump from code, to documentation, and back into code without my hands ever leaving the keyboard is a small, but meaningful improvement. Anthony Colangelo is a developer from Philadelphia building things at Big Cartel. He’s a generalist through and through, who loves everything from front and backend development, to building iOS and native applications. You can find him on Twitter talking about technology, design, development, and probably space, too. You should take a look at devdocs.io then. I have it running on our local servers, serving everyone here through a browser. This is freakin’ magic. Thanks for sharing! I’m in the middle of a project with several frameworks, languages, etc., all of which have Dash docs available. I wish I knew about this long ago (or at least whenever it came out). This is fantastic. Looks like I’ll have to pick up the power pack for Alfred soon. @Gustavo, devdocs.io is also a great resource. Thanks for posting that. I’ve been loving the Alfred + Dash combo as well. Makes looking up details a breeze! If you’re a Sublime Text user, there’s also an excellent Dash integration plugin called DashDoc: hit ctrl-h (or whatever shortcut key) in Sublime and Dash will look up the reference for the programming function or keyword currently under your cursor. It’s smart enough to limit the search based on your document’s specified language, too, so it doesn’t get confused when looking up something generic like ‘echo’. Probably can’t get much simpler than that…! One important thing about Dash is that it automatically downloads and installs the latest documentations. This means that the documents that are being referenced is always up to date! Thanks for the great post. 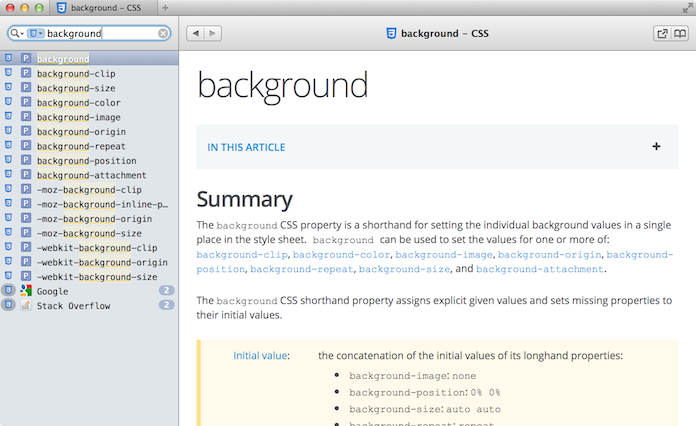 A good complement to docs are usage examples. I’d like to share Sourcegraph (sourcegraph.com), a site I helped make that shows usage examples for functions and modules in open-source code. I use it every day and hope you find it useful, too! Neat! Anyone know a Windows equivalent? A reason to get the paid version ( or at least explain why there is a download AND a purchase link — do I need to download the software and purchase a license? is the download a free trial? ), and a list of OS-es next to or near the download button. If it only supports OSX, that’s fine, but at least put a little icon next to the download button. The Steam online store does this pretty well — it has icons next to the purchase link that let you know what platforms the software works on. Protip: change the keyword from “dash” to “.” in the Alfred workflow. Not only is it much shorter than spelling out “dash”, but you get the added bonus of getting an immediately usable Google search result if you enter “. someFunction” and Dash doesn’t cover it!